Variety of colors, 2 sizes. Red hearts stickers. Variety of sizes. 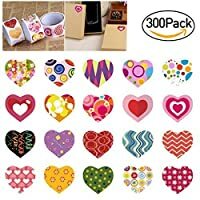 Colorful mini hearts stickers. Variety of colors. Gorgeous glitter and metallic heart stickers! These are great for sealing letters, invitations, birthday cards. The perfect finishing touch to your envelopes for any occasion. 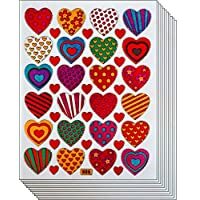 Stylish heart-shaped stickers to use for example wrapping gifts, seal envelopes, to decorate a gallery or your personal agenda/notebook. Each hearts measures approximately 1" and is made with acid free adhesive. Red and Pink Love hearts stickers. In a classic heart shape, these mini paper doilies make delightful cards or crafts. Comes in pink, white and red. Includes 100 doilies in vivid Valentine colors. Use for Valentine's Day; Award Charts; Wall Decorations; Teacher Supplies; Party Favors; Decorations; and more! Very suitable for DIY production. Various application for diary, letter, gift box any your own purpose, photo albums, scrapbooks even your phones. 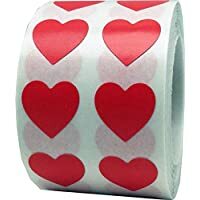 The red heart stickers are made of PVC and they are adhesive, and they are easy to clear and will leave no trace. 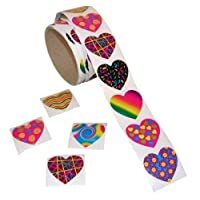 Use this heart labels for fun crafts and school activities and educational projects use for home, office and school， Valentine's Day, award charts, wedding party decorations and other hand crafts. Makes 3 Heart stickers. Large, small or the outline. Great for craft projects, scrapbooking, kids, and more. The gold glitter heart stickers measure approximately 1.5" x1.75". Perfect glitters sticker to add a decorative touch to your stationery, envelopes, thank you cards, party favors and gift boxes.